Gao, H., Sun, M. Y., Cheng, H. Y., Gao, W. L., and Ding, X. L. (2016). "Effects of heat treatment under vacuum on properties of poplar," BioRes. 11(1), 1031-1043. The influences of heat treatment under vacuum on the mechanical properties and corrosion resistance of untreated poplar wood were investigated in this study. Wood samples were heated in a vacuum atmosphere in laboratory conditions at 140 to 200 °C for 1 to 3 h. The color of the poplar’s surface after heat treatment was deeper than that of the untreated wood, and the dimensional stability of poplar was improved by increasing the temperature and time. However, the compressive strength parallel to the grain of heat-treated samples was slightly lower than that of the control samples. The modulus of rupture of samples heat-treated at 200 °C for 3 h decreased 41.25% compared with the untreated samples. The corrosion resistance of heat-treated poplar increased with increasing temperature and time. The white-rot fungus resistance of the treated poplar was better than its resistance to brown-rot fungus. With the increasing demand for wood, the amount of natural wood available is becoming limited. At present, plantation wood is used as a primary raw material and it has become an effective way to relieve the difference between the supply and demand of wood (Yang and Hu 2003). Poplar wood possesses many advantageous properties, such as broad suitability, high seed quantity, strong sprout ability, and fast growth. However, poplar has low natural durability and can be easily attacked by fungi during storage, transport, and final use. Heat treatment is an effective method to improve the dimensional stability and durability of wood, but, at the same time, heat treatment generally causes an apparent decrease in wood mechanical properties because of material losses in cell walls, hemicelluloses degradation, and the modification of long chain molecules (Xie et al. 2002; Ding et al. 2011; Sun et al. 2013). The treatment temperature commonly ranges from 160 to 250 °C. In previous studies, researchers have conducted experiments to determine the effects of heat treatment on the mechanical properties and corrosion resistance of different types of wood. According to Srinivas and Pandey (2012), the color of wood became darker and there was an improvement in the dimensional stability as well as a significant decrease in mechanical properties of heat-treated rubber wood and silver oak at 210 to 240 °C in a vacuum oven for 1 to 8 h. In addition, wood treated at temperatures higher than 200 °C displayed significantly improved durability against fungi (Hakkou et al. 2006). Furthermore, Driol and Guyonnet (1993) had studied the effects of wood heat treatment and temperatures for spruce, fir, and poplar, indicating that poplar could not be decayed by the soft rot fungi after being heat-treated. The steam-heat-treatment method has been used for improving the resistance of wood-rotting fungi from the study of Cao et al. (2011), while the oil-heat-treatment used for poplar could decrease the equilibrium moisture content to improve the quantity of wood (Bak and Németh 2012). Wood’s surface characteristics can be affected by different media, heat treatment temperatures, and times (Awoyemi and Westermark 2005; Tjeerdsma and Militz 2005; Unsal and Ayrilmis 2005; Wang and Cooper 2005; Xie et al. 2007, 2008). Vacuum heat treatment does not require any specific medium, nor does it require toxic chemicals in the process. Thus, vacuum heat-treated wood may be regarded as an eco-friendly alternative to preservative-impregnated or chemically modified wood. Therefore, vacuum heat treatment as a new technique would be used in the wood. In this study, the vacuum heat method was introduced for detecting the changes of wood properties, especially the mechanical and physical properties. The mechanical property of wood was investigated by modulus of elasticity (MOE), modulus of rupture (MOR), and compressive strength, while the color, density, and shrinkage of wood were used to detect the physical property characteristics of the poplar. Poplar (Populus deltoides Bartr. cv. “Lux” ex I-69/55) was obtained from Guangdong Province, China. 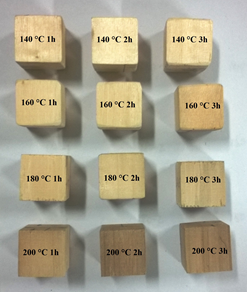 Poplar wood blocks with dimensions of 300 mm × 20 mm × 20 mm (L × T × R) were prepared from defect-free wood. Heat treatment was performed on poplar wood at 140, 160, 180, or 200 °C for 1, 2, or 3 h. The heat treatment process can be divided into three steps: heating, heat insulation, and cooling. Poplar was placed in the vacuum drying oven under negative pressure (-1 MPa) during heating-up. The initial temperature was 90 °C, which was raised 50 °C every 30 min until the set heat treatment temperature was reached. Heat insulation was the main part of the test; the temperature was set to 140 to 200 °C with a holding time of 1 to 3 h, and the whole heat treatment process took place in a sealed environment. The cooling period adopted a natural drop in temperature; this method ensures that the wood is still in a low-oxygen environment, preventing oxygen from participating in internal chemical reactions in the wood. When the temperature dropped below 100 °C, the material was removed. After being discharged, the evaluation procedures for the heat-treated and control poplars specimens were performed following equilibration in a climate chamber (Model: LRH-250-S, manufactured by Guang-dong Medical Equipment Co. Ltd) at 20 °C, 65% relative humidity (RH) until the changes of sample weights were less than 0.001 g over 24 h.
A photoelectric colorimeter (WSC-S, provided by Beijing Huatai Xingrui Technology Co. Ltd.) with an illumination of 20 mm was used for color measurement. The color parameter L*, representing the lightness, was measured according to the CIELAB method. A higher L* value means a lighter color. where ρ is the oven-dry density, V0 is the oven-dry volume (cm3), and P0 is the weight in the oven-dry state (g). where (R1, T1), (l1, l0), and (V1, V0) are the radial length (cm), tangential length (cm), and volume (cm3) of specimens, respectively, at testing and air-dry conditions. (R2, T2), (l2, l0), and (V2, V0) are the radial length (cm), tangential length (cm), and volume (cm3) of specimens, respectively, at testing and oven-dry conditions. where Pmax is the load at failure, P and f are any load and its corresponding displacement below the proportional limit, L is the span length, and b and h are the width and height of the specimen, respectively. where σ is compressive strength parallel to grain of wood, Pmax is the load that ruptures the sample (MPa), and b and h represent the width (mm) and height (mm) of the sample, respectively. where M1 and M2 are the dry mass before and after the fungal test, respectively. The FT-IR spectra were obtained on an FT-IR spectrophotometer (Bruker Tensor II ) using a KBr disc containing 1% finely ground samples. Thirty-two scans were taken of each sample recorded from 4000 to 400 cm-1 at a resolution of 2 cm-1 in the transmission mode. Figure 1 shows the FT-IR spectra of the untreated and heat-treated specimens. In the spectrum of the raw material, the peak at about 3392 cm-1 is indicative of the stretching of the hydroxyl groups (Yang et al. 2010). The band at 1595 cm-1 is originated from -COO- of uronic acid or uronic carboxylate in hemicelluloses (Marchessault and Liang 1962). The band at 1025 cm-1 is attributed to the C-O bond stretching frequencies of hemicelluloses. A band at 895 cm-1 is due to β-glycosidic linkages between the sugar units (Ebringerová et al. 1992). The aromatic skeleton vibration in the lignin fractions occurs at 1595, 1506, and 1421 cm-1. Absorption at 1461 cm-1 indicates the C-H deformations and aromatic ring vibration. The peak at 1152 cm-1, corresponding to C=O in an ester group (conjugated), gives signals for typical GSH-lignin (Faix 1991; Wen et al. 2013). It was found that intensity of the band at 895 cm-1 was decreased with increasing heat-treatment time and temperature. The band at 1659 cm-1 is attributed to conjugated carbonyl stretching in lignin, which was decreased from the spectra of heat-treated poplar. The results implied that the hemicelluloses and lignin were degraded in the heat-treatment process. Figure 2 shows the color difference between control samples and heat-treated samples. The color of the poplar surface after heat treatment was deeper than that of the untreated wood. However, no significant relationship between the color and other properties could be established. It has been reported that color changes occurred during heating process (Sundquist 2004). Data from color measurement confirmed the visual sense (Table 1). From Table 1, it can be seen that the value of L* of samples decreased from 81.47 L* to 62.09 L*. A similar result was obtained by Esteves et al. (2008), who found that a decrease of L* was related to chemical changes during heat treatment. The yellow-blue index before 180 °C increased with an increase of temperature. The largest yellow-blue axis chromatic index was 18.22 b* at 160 °C for 3 h. The saturation value of the treated wood increased 29% at 200 °C for 3 h in comparison to the corresponding values of untreated wood. 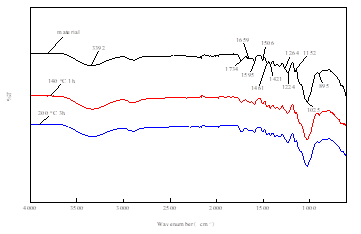 The overall chromatic change (ΔE*) increased with increasing temperature and time. By adjusting the heat treatment temperature and time, heat-treated wood of different colors can be obtained, even imitating precious wood, so that diversification of the product and improvement of its value can be achieved (Xie et al. 2009). 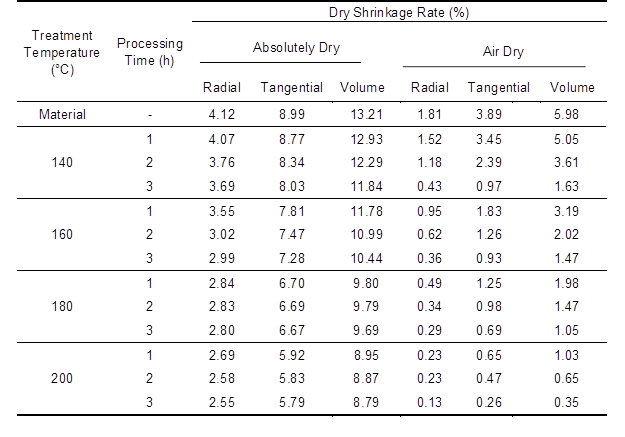 The values of average oven-dry density loss rate of control samples and samples treated with different temperatures and times are presented in Fig. 3. As shown, the oven-dry density loss rate of wood increased with increasing temperature and time. When the treatment temperature reached 200 °C, the value of oven-dry density loss of the control samples was even higher than that of the heat-treated samples. This might be due to the degradation of hemicelluloses, starch, pectin, and other nutrients. Table 2 displays the values of average dry shrinkage rate of control samples and samples treated at various temperatures and times. As shown, the heat-treated samples exhibited better dimensional stability in both radial and tangential directions. Under the treatment temperature of 140 °C, the dry shrinkage of heat-treated samples decreased slightly. Dry shrinkage of heat-treated samples decreased with increasing temperature and time because the amount of free hydroxyl groups was reduced during hemicelluloses degradation at high temperatures. However, the crystallinity of heat-treated wood was higher than that of untreated wood because of the better thermal stability of cellulose (Akgul et al. 2007; Phuong et al. 2007). Both of these changes reduced the accessibility of water to wood. 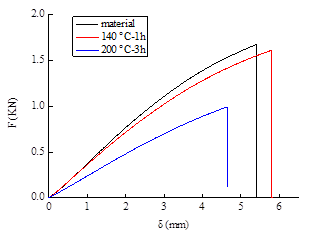 Figure 4 shows the load-deflection curves of the untreated and heat-treated specimens. Under the treatment temperature at 140 °C, the maximum load of heat-treated sample was slightly lower than that of material. 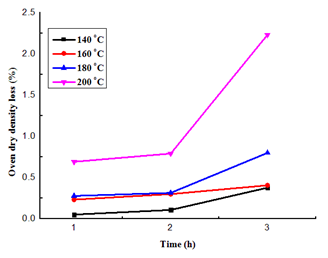 However, the maximum load of heat-treated sample was decreased which was due to degradation of hemicelluloses and lignin when the treatment temperature reached to 200 °C. The specific results of the data shown in Table 3. The influence of the temperature and duration of vacuum heat treatment on the mechanical strength is shown in Table 3. It can be seen that the CS of heat-treated samples was slightly lower than that of the control samples, but the MOR of treated wood showed a greater decrease. The MOR of wood treated at 200 °C for 3 h decreased 41.25% compared with the untreated wood. It was clear that the MOE of heat-treated samples at 140 °C for 1 to 2 h increased and then decreased greatly at higher temperatures, which is in agreement with the results of Esteves et al. (2007). As previously mentioned, the decrease in MOE can be attributed to the degradation reactions of wood polymers (Yildiz et al. 2006). Kocaefe et al. (2008) studied the effects of heat treatment on the chemical composition and mechanical properties of birch and aspen wood. Their results also implied that the decrease in the mechanical properties of the woods was due to the degradation of hemicelluloses and lignin. 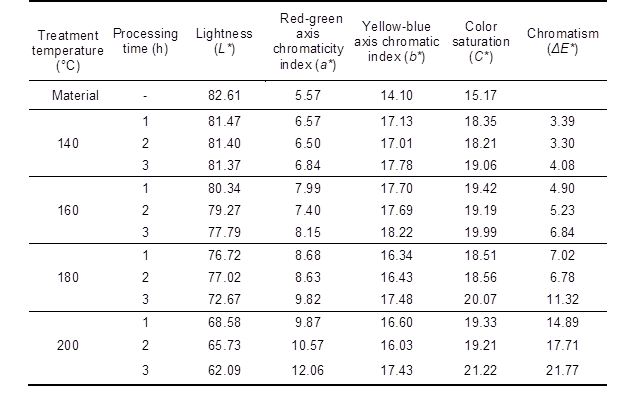 Table 4 shows the corrosion resistance rating standard of the wood (Ma et al. 2009). 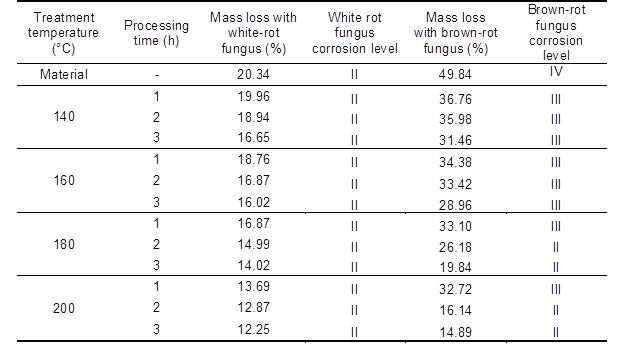 The average weight loss and natural durability classification for vacuum oven-modified poplar infected by white-rot fungi and brown-rot fungi are shown in Table 5. It can be seen in Table 5 that the brown rot fungus attacked the wood according to classes II and III, and the mass loss of heat-treated wood decreased by 34.95% compared to non-decayed wood. The durability classification of heat-treated wood was not changed by white-rot fungus, but the mass loss of heat-treated wood decreased 8.09% compared with that of untreated wood. This occurred because the hygroscopicity of heat-treated wood is lower than that of untreated wood, and the high moisture content of the wood is beneficial for the development of fungi; thus, a lower hygroscopicity is likely to improve the decay resistance of heat-treated wood. In addition, the chemical composition of wood was changed during the heat treatment, especially the degradation of extractives and hemicelluloses. The degradation of hemicelluloses during heat treatment may result in less substrate being readily available for the fungi. Both of these changes improved the durability and antibacterial property of the wood. In this work, the modification of fast-growing poplar using vacuum heat treatment was studied, and the changes in physical properties, mechanical properties, and corrosion resistance were analyzed. From this study, it can be concluded that the color of poplar’s surface became deeper with higher treatment temperatures. The dimensional stability of heat-treated wood increased with increasing temperature and time. The mechanical properties of treated wood decreased, and the corrosion resistance of untreated poplar was weaker than heat-treated poplar. The corrosion resistance of treated poplar improved with increasing temperature and time. The vacuum heat treatment improved the dimensional stability and durability of poplar but reduced its mechanical strength. Because of this, further improvements in the mechanical strength of poplar are needed. This work was supported by Scientific Research Innovation Platform of Higher Education of Anhui Province (Biomass based materials of Forestry Group). Driol, D., and Guyonnet, R. (1993). “The improvement of wood durability by retification process,” 24th Annual Meeting of the IRG/WP. Sundquist, B. (2004). “Colour changes and acid formation in wood during heating,” Doctoral thesis. Divisions of Wood Material Science. Lulea University of Technology, Skellefta. Article submitted: August 31, 2015; Peer review completed: October 16, 2015; Revised version received and accepted: November 21, 2015; Published: December 4, 2015.